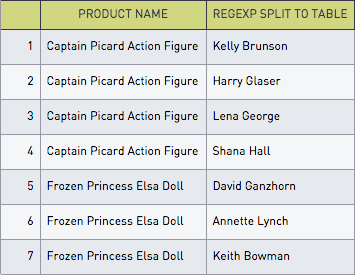 Every once in a great while, the enterprising SQL analyst is confronted with data that is not relational in nature. Often this data has been imported from an event-tracking system or a NoSQL database. Such data commonly takes the form of comma-separated values. Dealing with this data can be a pain in the SQL. Let’s say we want to count the number of purchasers for each product in this table. Depending on your DB system, there are a number of ways to do it. As always, Postgres’s solution is straightforward. Given a regular expression, functions are available that split the string to a table or to a Postgres array. Both strategies give us our hoped-for final result: number of top purchasers per product! MySQL and Redshift lack special functions to save the day, so we’ll fall back on a hack: Remove all the commas from the string, and see how much shorter it is! length gives us the length of a string, and replace(top_purchasing_users, ',', '') replaces commas with empty strings, effectively removing them from the string! If there are 3 commas in the string then there are 4 purchasers, so we add 1 to the result. The comma-replacement trick works in SQL Server as well. But if, like us, you always enjoy an excuse to try a recursive solution, then read on! The line above union all is our base case: We start with the product name, the list of top purchasing users, and the position of the first comma. The clause immediately after the union all is where the magic happens. Each time we recurse, we keep the product_name and top_purchasing_users intact. But when finding the comma position, we start our search at the previous recursion’s comma position! substring(product_name, comma_pos + 1, len(s)) is the part of the string that starts right after the previous comma position, and the charindex surrounding it finds the first comma position in that substring. We reassign that comma position to comma_pos to set up the next recusion. Finally, our where clause terminates the recursion if there are no more commas. As always, Captain Picard wins the day.